I think "Why Goalies Need Overdrive" is prerequisite for this page. This page is getting really big so it may take some time to load. Sorry about that but there is a lot of info here. Also, some Flash pages at the bottom are big files. Without Overdrive, goalies continually widen out more than is necessary. This takes a cumulative toll on the knees, groin and back and results in chronic aches and repetitive stress that is considered the norm after 5 or 10 years of goaltending. These aches and strains periodically flare up into full fledged injuries, often on simple plays that the goalie has done many times before. On this page I'll show how widening out too much causes injuries and of course, how Overdrive reduces the danger. While there are a million ways to hurt yourself that Overdrive does not cover, I believe the strain of involuntarily spreading out too much is the main cause of chronic injury among goaltenders. Word check time for the kids- Chronic: Kronos,Greek God of Time. Chronic injury means it's there all the time, it never goes away!! At first glance, this makes perfect sense. Since most goalie movement involves widening out laterally, this should be the first place to look! The human body is not well designed for widening out. Our legs are made to move within the narrow field we use for running or walking or jumping. Since we're restricted in this way, we rarely widen out except to modify direction or do the occasional sidestep. Normal human activity doesn't require much more. Our anatomy confirms this. The swivel of the hips, the swing of the legs, the knee joint, the direction our feet point; all made for forward motion. pushes the restrictions nature has placed on us. for widening out is related to the chronic injuries. For any motion, muscles group into pairs. One set contracts while an opposite set stretches. So when you flex or contract your biceps, the triceps on the back of your arm stretch. To return your arm to position, the opposite happens. 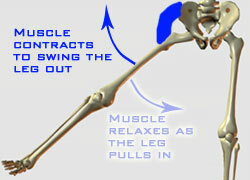 Every muscle must have an opposite muscle, otherwise it could never return to position for reuse. the hip flexors swing it up. 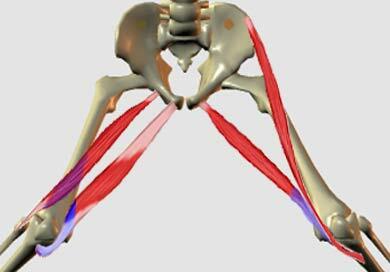 So on any motion, each muscle performs two motions; it contracts going one way, then stretches going the other. 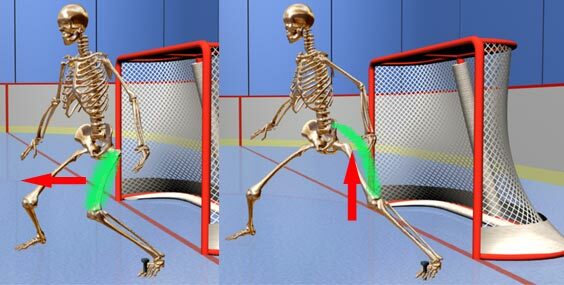 Before looking at which muscles work on a widening out move, let's review how muscles get injured and how this applies to goalie movement. This is the first Flash movie on this page so if you don't see a pic of muscles below, you need the plug-in. So let's have a closer look at the muscles in these two groups. 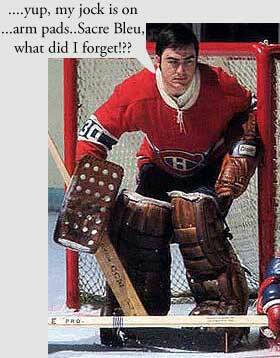 For all the widening out goalies do, it doesn't work this group too hard. That's because the friction of the ice does a lot of the work when you widen out. If you want to widen out, just slide out. 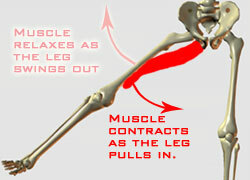 The muscle does some work but there's no need to physically lift you leg and place it laterally. 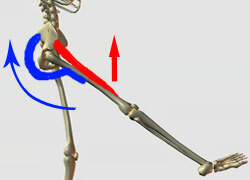 To the right is a side view of your hips and the Gluteus Medius which is mainly responsible for swinging the legs out. To the far right is a side view of the Gluteus Maximus. Widening out isn't the main purpose of this muscle but it does help out. If you swing your leg out you can feel it tightening. To the left is a rear shot of some of the smaller hip joint muscles. All except the Quadratus Femoris will contract to help swing the legs out. However, they are so small that I wonder how much they contribute to the motion and I suspect they mainly stabilize things. Apparently, injuring the Piriformis can be hell on wheels because it sits so close to the Sciatic nerve. So that's the hip group. We've already seen in the Flash piece that these muscles are not at great risk on widening out moves. Of course injuries are still possible but there just aren't enough glute injuries out there to lead us to suspect that they are anything but random events and therefore this part of the widening out move is unrelated to the chronic injuries we are interested in. As a side note, the same reasoning applies to the quads, which supply a lot of the power for a lateral push (or running or walking). Because of their insertion points, widening out doesn't really affect them but since they are involved, let's have a look. The right leg shows only the Vastus and the left leg shows only the the Rectus Femoris. For push, Nurminen uses his left leg quads and glutes. His right leg uses the Gluteus Medius to swing that leg out a bit, his hamstring lifts the foot back and the hip flexor (Rectus Femoris) lifts the whole leg a bit. In the Flash piece these were the muscles most at risk from widening out. So let's see exactly which ones are involved and if they are related to the chronic injury areas. You can tell by the striations of the muscles that the groin will stretch on widening out. The groin pulls the thighs together again after you have widened out but it was not made to widen out this much this often. Also, I don't think there's another muscle group in the body that is forced to stretch this far before it takes on a load. Compared with the large, thick quads this isn't a lot of muscle coverage considering what goalies do with it. This is nothing like the widening out of a ballet dancer leaping through the air. 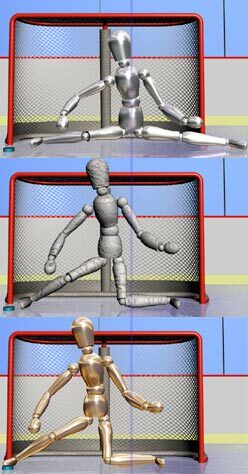 Goalies hit the ice hard at full extension with their own weight, their equipment weight and the force of the kick or move. The groin was not made to repeatedly contain all of that at that width so it's no mystery why widening out strains the groin. Again, the insertion points show that widening out will stretch these muscles. They all insert below the knee and this explains why you will most definitely feel strain down there if you widen out too much. 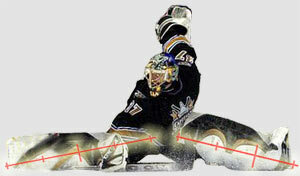 This is why goalies fold at least one leg back on most moves (below); it relieves pressure by shortening these muscles. I'm not sure how much the hamstrings suffer on widening out but they definitely add tension to the knee, which is a very complex joint. I suspect the Sartorius is more vulnerable. The right leg shows the Biceps Femoris and Semimembranous and on the left leg is the Semitendinous. 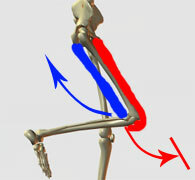 These form the Hamstring group and the blue portion indicates that they insert behind the knee. The Sartorius shown on the left leg goes from the crest of the hip around to the front of the knee. 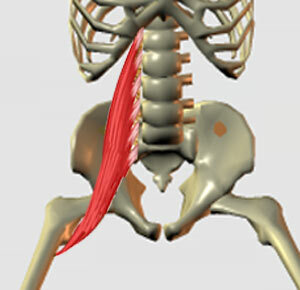 At the hip joint there are also several smaller muscles worth mentioning. The Obturator Externus (left) is a likely candidate for strain on widening out as is the Quadratus Femoris (right) but I haven't noticed much mention of them in the literature I've read. I wonder if you have to really tear the groin before you damage these ones. So it looks like widening out too much can strain our three chronic injury areas, the groin, back and knees. If this were just simple everyday widening out it would be bad enough but goalies spread out laterally with an explosive kick or push and the legs are weighted down with skates and pads. So if you're going to abuse the body with what almost amounts to unnatural movement, what else can you expect? Repetition will test the weaker links and one day there will be a move that pushes things a little too far. That move could come in the following way because some widening out is more dangerous than others. The difference is that in the left photo, the left foot held its position and in the right photo it did not and slipped backwards. The backwards slip in the right photo is caused by boot-out and as I've described many times on this site, it's when the skate rolls on its side as you widen out and the side of the boot levers the main blade off the ice so that it slips out on the plastic of the boot. But if the goalie ends up equally wide in both moves how can one move be more damaging than the other? The difference is control. A secure grip keeps your muscles in control of the move. With a solid foundation, when you push off, the leg muscles can dictate the speed at which you spread out and drop down. As you widen out, weight is gradually passed off to the groin and in case of danger this control can help you bail out of the move. Actually, this is what the muscles are made for and what they do every time you take a step. Among other muscles involved, the quads (left) will dictate how fast you push across and the glutes (right) will help lower you at as safe a rate as possible. However, when there is no grip and the foot slips out, all of this muscle control is removed. The muscles can't do a thing with nothing for the feet to grab onto. How quickly you widen out is no longer dictated by your muscles but by your weight and gravity; if you've slipped on ice you know has quickly gravity works. (Joke time: Your legs are now out of your hands) Widening out suddenly can catch the body's defenses off guard and you'll spread out faster and farther than intended. At this point it's up to the groin to contain things but instead of the weight being loaded on in a measured manner, there is a risk of overloading as it takes on all the weight in a sudden burst. So a graph of the difference between the two widening out moves would look something like this. This is only a representation of what happens and doesn't reflect actual numbers. Green:With no slipout, the speed of widening out will be governed by the muscles and remain fairly constant. It will accelerate a bit and then tail of as you get wide. A controlled move is always slower than a slipout so it extends farther along the graph. Red: On a slipout, the speed spikes noticeably, as it would on any slip. The Johns Hopkins site states that a major factor in muscle strains is the speed at which a muscle is pulled. Green: With control, the load on the muscle is gradually increased. Again, the move is slightly longer. Red: When you bootout, the load on the muscle increases very quickly, creating momentum that will temporarily increase the load beyond expectations. The area above the dotted line represents a potential injury. Green: Your width increases steadily on a slightly longer move. Red: On a bootout your width spikes and momentum will widen you out more than you intended before you pull things together a bit. The area above the dotted line represents a potential injury. So while widening out is not the best thing for the human body, widening out from a boot out can be even more dangerous. Whether you are skating or skiing or driving a car, control is safety. If a goalie can do the splits, he can withstand the width but again, the danger lies in the speed of widening out and as such he is just as vulnerable as other goalies. In fact, because they can do the splits these goalies widen out much more often so they're more likely to get caught on a dangerous boot-out. One hint of this is that the full splits seems to be mainly for the younger goalies. You'll see goalies come into the NHL using the splits a lot but then the injuries come and by the time they hit their late 20's they have to modify their style to stay healthy. Cujo rarely widens out anymore, Patrick Roy never did at the end of his career, Tommy Salo; never, Belfour, very rarely, Brodeur doesn't do it much anymore; he's more of an old style standup goalie now, Kolzig is doing it less and less, Thibault is starting to collect injuries. While the splits stops pucks, the goalies eventually pay a price because they do boot out more. This is significant because most young goalies coming up consider the splits a requirement for the wider style that predominates. One interesting note that I have mentioned before is that while the old style of widening out doesn't stop pucks nearly as well, it might be safer. In the event of a boot out on the pushing foot all is not lost because kicking out with the toe up keeps the heel on or near the ice and it can dig in to control widening out. Also, by turning the toe up, the kicking leg stresses the stronger hamstring and not the groin. Now, goalies must widen out with the pads face out for coverage. Shots are far too fast to rely on the old style. However, in the event of a boot out both skates are on the plastic and there is nothing to do but spread out on your groins. One thing to remember is that bootouts use more width to complete a move. A goalie with a secure footing (left) widens out much less than one whose foot slips out (right). For the goalie to the left, it's not a stressful move but for the one on the right it definitely is. Finally, there is momentum. The whole purpose of pushing off is not simply to widen out, but to propel you in a direction; as when we walk, run, etc. When you push off this shifting of the body depends on your footing and affects how much you widen out. The faded blue line is the starting point for the 3 goalie's moves. A bootout will give you very little momentum (I showed zero here). There is no shifting in the direction of the puck so you'll have to reach it by widening out. A goalie not wearing Overdrive has to avoid a bootout by stopping his push before he rolls the boot into the ice. This limits his power but should give him some momentum towards the puck. With a solid footing (ie: with Overdrive) a goalie will get a full push and his body will shift more in the direction of the puck. He'll have to widen out less to make a save. While the above photos demonstrate the point, kick saves happen very quickly so directional shifting may not be a factor. It happens but it doesn't always happen fast enough to help stop a hard shot. How momentum can replace widening out is more noticeable in the larger moves. Above, I go from side to side without widening out very much for very long; my momentum moves me. Below, Osgoode has very little momentum in his move, doesn't go very far and must widen out a lot to cover the net. Also, notice that I have enough momentum to recover whereas Osgoode ends the move by squashing down on his groin. The important point here is that momentum helps to close you up again after widening out. Even on a kick save this directional shift can be used to pull the legs back together again after you have widened out, instead of squishing down on stretched muscles. A solid grip reduces widening out and when you do widen out, it helps you to finish up in a safer position. 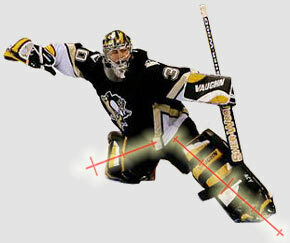 Most pro goalies have legs like horses but without Overdrive they're stuck with moves like this. So that's the end of this section. We've seen that widening out is dangerous and that a lot of widening out is unnecessary simply because goalie skates often cannot hold the ice. Now that we have an idea of how goalies can injure themselves from widening out, it might be a good idea to get on the ice a see exactly how this can happen. the simple bootout I've been talking about all along. The severity of the injury will be dictated by the force the bootout exerts. More force on the tissue creates more damage. The force of the bootout is dictated by how much weight is on the foot when it boots out. More weight on the foot creates a faster, heavier bootout. The weight on a bootout varies according to the point in the move at which you slip. the pushing foot than one later in the move. wider stance than from a narrow one. Here's why. Above we have 3 goalies. 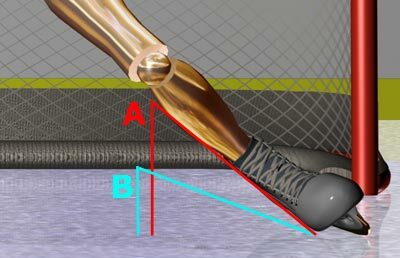 The gold one has a narrow stance (A), the copper one has a wider stance (B) and the silver goalie is very wide representing their injury point (C). 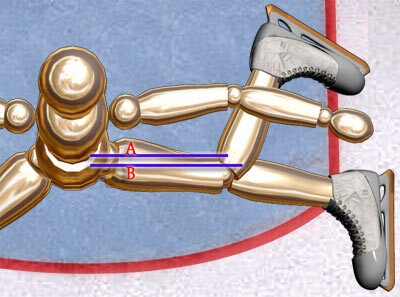 If the narrow, gold goalie slips out at point A, he has time (t) from A to C before he hits the injury point. 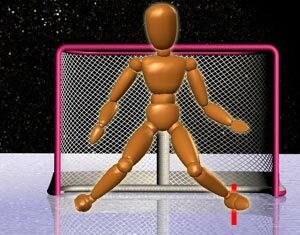 If the copper goalie slips out he has less time (t) before he hits the injury point, B to C. A goalie in a very wide stance would have even less time. So the factors above boil down to one thing: time. 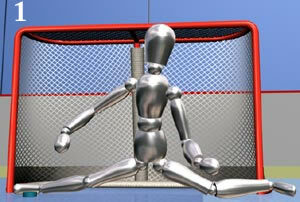 A slip at the beginning of a push out of a wide stance gives a goalie the least time to protect himself. That's where this injury is most likely to happen. 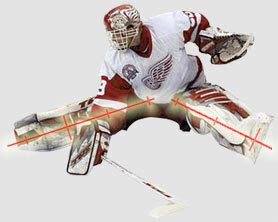 This helps explain why goalies are getting more lower body injuries than in the old 'stand-up' or 'narrow stance' days. However, those days are gone and goalies have no choice now but to adopt a wide stance. Pucks travel too fast to be able to kick the feet out; they have to be positioned beforehand. The safe position (again, my term) is the least stressful position for your leg when you go down. With the leg folded back and close to the body there is no chance of a pull. 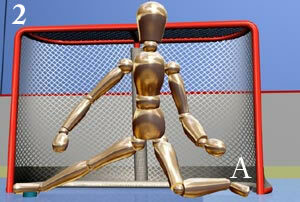 On a slipout a goalie will try to avoid injury by folding the leg back into this position. Just to be thorough, let's take a closer look. Folding the leg back relieves tension around the knee. On the anatomy we saw that several muscles, including the hamstring group connect below the knee (You can feel their tendons behind your knee). 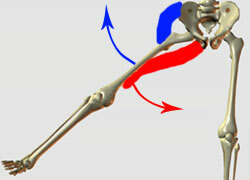 Folding the leg back shortens this group (eg: B-A). Since the knee is such a complex joint, relieving this tension likely also relieves stress on other connective tissue (ligaments) in the joint. Folding the leg back also allows you to drop the knee to the ice. This further reduces stress on the knee, eases the strain on the groin as you aren't as wide (red angles) and improves coverage along the ice. As the foot is folding back, the knee will also bend up to bring the whole leg back into the body and reduce the angle on the groin. So let's put all this together and take a closer look in the Flash piece below. And here are some video clips to have a look at. safe position. Click through the Flash piece below for more. 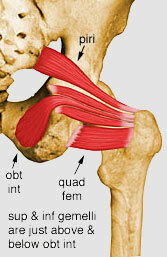 but it is still very wide and the focus of strain will be on the upper groin. And to the left is a link to some video clips. While Injury 1a can involve a slipout strong enough to cause a catastrophic strain, the chances of that happening with 1b are less for a number of reasons. First of all, by the time you land, a lot of your weight has already been transferred over to the other leg so it won't be used to widen you out in the opposite direction. This means that backwards motion will also be slower so the muscles can control things easier. With the knee bent, the weaker, thinner muscles aren't involved, especially the sartorius. If you do get close to overloading the muscles, leaning forward or even doing a face plant is a quick and easy way to relieve the pressure. For most goalies, I think the main danger here would be from cumulative wear because this type of widening is common now with the butterfly or pro-fly styles. The volume of this move could also work in conjunction with weakness elsewhere to contribute to strain. Most vulnerable would be the goalie with superior flexibility. They can get so wide ( like Esche or Legace, above) that the position locks them in, making it momentarily awkward to relieve the pressure. The downward pressure of their weight can then squish the groin lower to the ice, possibly into injury. Medically this injury is a lot like injury 1a but I gave it a different name because the moving leg has different mechanics. We can re-use the pictures above but we're now looking at the leg that is kicking in the direction of the save. The injury is simple: as you stretch the leg out straight to stop the puck you strain the inside of the moving leg anywhere from the knee to the upper groin by widening out too much. Your flexibility determines whether you can handle the stretch or not but if you are very flexible (like Esche, above) you can lock into the 'squishing down' effect like injury 1b. The injury area is exactly the same as 1a, so what's different? First of all, it's a voluntary slip out. You want the foot to slide out; it just slides out too far. Injury #1 is an involuntary slip back where the weight on the leg pulls you too wide. Here, in order for the leg to move there is very little weight on it and you simply widen out too much as you reach for the puck. Since the puck decides how wide you'll have to get, the problem here is you can't fold the leg back to relieve the pressure unless you don't want to make the save. If the kicking leg is widening out to the danger point you can either let the puck go in or keep reaching and hope you don't strain anything. Not until the save is over can you relieve the pressure. We'll look at two ways you can injure yourself in this way; if the pushing foot holds or if the pushing foot slips out. In image #1, imagine that the goalie's left (pushing) foot stayed planted as he kicked out to stop the puck. He could injure himself if the stretch was too much for him. This kind of injury will always be part of the game and there is nothing Overdrive can do about it. Athleticism always involves pushing the body to its physical limits. However, let's imagine that image #1 shows the result of a slipout and the left foot actually started at point 'A'. Obviously #2 shows a relatively stress free save while #1 shows a considerable widening out of the moving leg. Until now, for simplicity I've looked at the legs in isolation but things are a little more complicated on the ice. Obviously image #1 also shows a considerable widening out of the pushing leg so it is possible to have either injury 1, 1a and 2 on any particular slipout. Widening out on one leg affects the other leg and this can also pull all the little hip muscles into the mix so a weak link anywhere in there can go. So here's some video evidence on overextending not only the moving leg but both legs at once. You can review the previous video clips to apply the information I discuss here. Of all the weak points in the human body, the back is the weakest. We have evolution to blame for this one because man is the rational ANIMAL and we weren't made to walk on two feet. Among other things, our erect posture has created a spinal curvature near the hips. Excess accentuation of this curve can cause herniation of the discs between vertabrae resulting in pressure on the local nerves. Ask anyone who has had sciatica (as I have) and they will eagerly describe a whole new world of pain radiating down the leg. In the general population, back problems are to be expected past a certain age, especially in the lower back (L4-L5). Damage to this area likely lasts a lifetime since the discs have a limited ability to repair themselves. Back problems are kind of like some family members- you're stuck with them for life. So in spite of the benefits, hockey being one of them, walking on two feet has its drawbacks. Goaltending is not at all kind to the back because of the stance, the continual pounding from going down and also from excess widening out. Injury at some point is almost a certainty and problems can begin at a young age. Even without catastrophic strain, the sheer repetition of the movements will accelerate the normal degradation of the spine. If you're serious about goaltending you absolutely must develop a regimen of preventative stretching and maintenance with advice from specialists. This is especially important now because new goaltending styles are prone to excess widening out which will accentuate the curve on the lower back. forward on the spine, accentuating the curve. Slipouts pull more forcefully on the spine. Although it is very easy to relieve pressure on the back by leaning forward, most of the time that is not an option simply because you have to stay with the play. You have to keep your chest and head up to face the puck. This combination will result in some very serious arching of the lower back. Also, the speed of widening out plays an important part as it can create a whipsaw effect. A quick widening out (as in a slipout) will pull the chest forward and then a quick reaction by the goalie to stay erect can focus a whole lot of pressure on the crucial L4-L5 area. These goalies are all very wide, which arches the back by pulling on the Psoas, but they have to arch it more to keep the chest up to stay with the play. 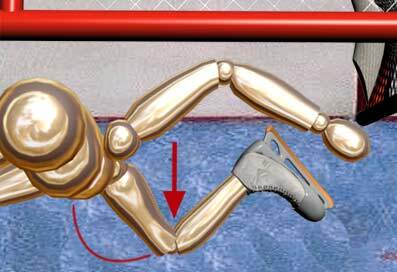 Contributing to this arching of the back is the action of the skate slipping back. When the foot has to fold back very quickly into the safe position, as on a slipout, this backward action of the leg is often counterbalanced by a forward leaning of the upper body. Anything that contributes to forward lean will add to back arching. 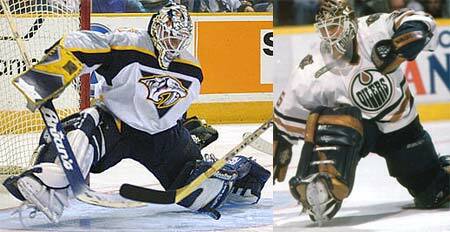 Here Tommy Salo's left foot doesn't hold very well. It's not a major slipout but by frame 2 you can see that the foot is closer to the post. His balance wasn't very good either, which amplifies the effect and serves to demonstrate better the forces at work. The left foot folds back quickly and by frame 3 and especially frame 4 you can see the arching on his back as he tries to straighten. By frame 5 he's leaning forward to relieve the pressure. Finally, there is the impact on the ice to consider. Every time a goalie drops to the ice, there is a slight shock of landing that will reverberate up from the knees to the hips. It may be an insignificant jolt but this is amplified when you consider how many times in a game and a year goalies do this. Conservatively estimating 300 times a week easily translates into 100,000 times in 10 years. When a goalie goes down, he goes off his edges at about 45 degrees so it will be a drop of A. With Overdrive, you go off your edges at about 22 degrees so it will be a drop of about half the distance. So here's some video evidence. If you review any of the previous clips you'll also be able to see the effect of slipouts on the back. Excess widening out causes injury and Overdrive prevents excess widening out. Finally, this page looked at self-inflicted injury but there is another world of pain out there thanks to over-eager forwards. This has nothing to do with Overdrive but is an important consideration for all goalies. 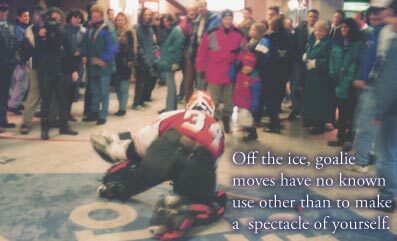 Opposing players and refs must know to respect your space. If they don't and your D does nothing you must know how to get the word out. Opposing forwards take as much as they can get away with so crease violations must be stopped before they cost you a serious injury. Hockey is a rough, dangerous game and sometimes you have to consider something other than warnings and begging the ref to earn his money. Here's a lighter look at Eddie's fine example and another of Cloutier being run.